In the world of energy, fossil fuels usually get most of the attention. These are your oils, natural gases, and coal. 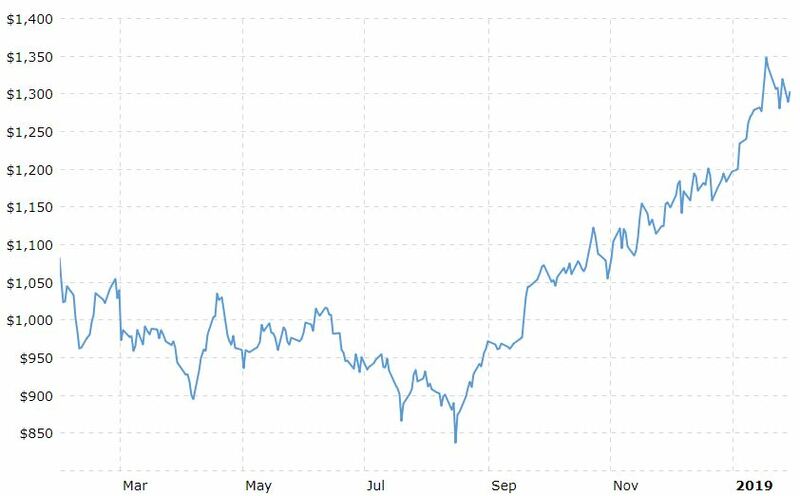 When the guy on CNBC says, “and now let's take a look at the energy markets,” he's probably going to talk about crude oil prices next. In recent years, green energy technologies like solar, wind, and hydro have soared in popularity and now share some of the spotlight with fossil fuels. But, generally speaking, the main focus of the energy industry has almost always been on the natural resources used to generate power; whether it's oil or wind. Thing is, the power source is only half the energy supply equation. There's an entire group of other natural resources needed to support the global energy system for things like storage, distribution, and other vital tasks in the supply chain. And among these natural resources are what we call the Energy Metals. Well, it's an unoffical term. And if you ask a dozen people you'll get 13 different answers. So before we begin let's go ahead and define exactly what we mean by an energy metal. Almost every metal you can name plays some role in the energy industry. Energy is just that big. But there are some metals that play a much larger role than others in terms of their own availibilty. Other metals contribute to the energy industry. Silver, for example, is a key ingredient in solar panels. And a lot of silver demand does come from manufacturing solar panels. But the biggest end-use for silver is ultimately jewelry. On the other hand, a metal like platinum is a key ingredient for jewelry makers. But the biggest end-use for platinum is cleaning fossil fuel emissions. In this report we'll examine the role each of the energy metal plays amid the energy industry and discuss what we believe to be the best investment approach for each metal for the 2019-2020 period. Generally speaking, the largest source of all energy demand comes from transportation. But the generation of electrical power is a pretty close second. Of course the importance of electricity cannot be overstated. And let's be real, electricity seems like pretty old news. Am I right? I mean, we have so much access to electricity, you can pretty much find a spot to plug your dead cell phone in anywhere. The expansion of electrical generation and distribution systems in the United States began in the mid-1880s and was fully built out by the 1950s. The rest of the world, however, doesn't have it so good. An estimated 1.2 billion people around the world have little or no access to electricity. 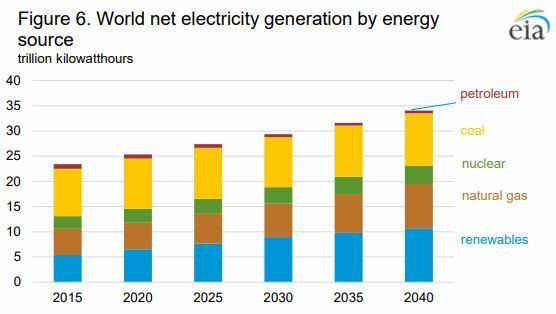 In their IEO2017 Reference case, world net electricity generation increases by 45%, rising from 23.4 trillion kilowatt hours (kWh) in 2015 to 34.0 trillion kWh in 2040. There are many different natural resources used to produce electricity. The three main sources of electricity here in the United States and other developed nations today are coal, natural gas, and nuclear. Wind, hydro, biomass, and others also contribute. But as we've already touched on, the source of electricity generation is only part of the whole story. See, it doesn't do any good just to produce electricity. You also need infrastructure to send it your customers. That's where copper steps in. 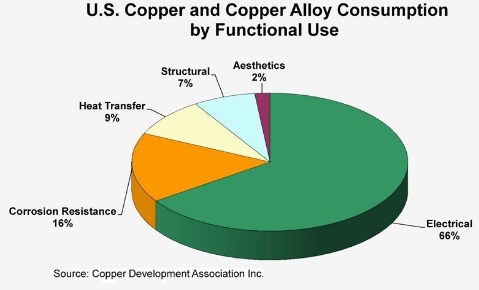 Approximately 2/3 of all copper and copper alloy demand in the U.S. comes from electrical applications. The rest is divided between corrosion resistance, heat transfer, and structural applications. Only 2% of all copper ends up as an aesthetic application. And the metal is absolutely everywhere. It's completely surrounding you right now if you're in any kind of building with electricity. Everything that's plugged into a wall is using a copper wire to move electricity from the wall to the device. Every wire connected to a wall socket in every building is made of copper. The wires that brought the electricity to the building are made of copper. And the wires that brought the electricity from the power plant, through all the transformers and whatnot, all copper. If the power plant was the heart of the electrical grid, it's veins would be made of copper. It's not a stretch to say copper is just as important to the electrical system as any generation method or storage system. According to the latest analysis from Fitch Solutions, the global copper market is undersupplied and demand set to rise 2.6% per annum through 2027. 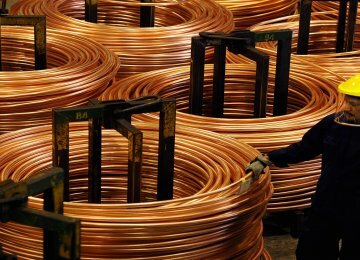 Fitch warns global copper consumption is outpacing supply, with rapid increases in demand from China for power infrastructure and electric vehicles. 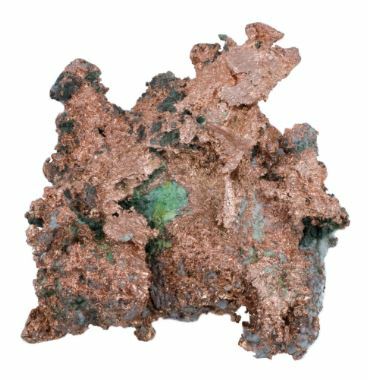 Copper is used extensively all throughout electric vehicles, charging stations, and supporting infrastructure. In fact, there's more copper in an electric vehicle than in conventional cars. A typical conventional car will have anywhere from 18 to 49 pounds of copper in it. A plug-in hybrid electric vehicle, contains around 132 pounds. And a full battery electric vehicle: 183 pounds of copper. As a result of all this, global copper demand is expected to remain healthy in the short- and long-term. Copper isn't going anywhere. Even though the world is switching to use less fossil fuels (particularly coal, which is used a lot in electrical power generation) it doesn't matter what the power plant is using to produce electricity; it's going to use copper to distribute that electricity to customers. A coal-fired power plant and a wind farm are essentially on completely different ends of the pollution spectrum. But both are going to use copper wires to distribute electricity to customers. Among the energy metals we'll discuss in this report, investors will find copper as one of the best options. Demand is set to remain high, supplies are tight, and copper is absolutely vital to electrical distribution. 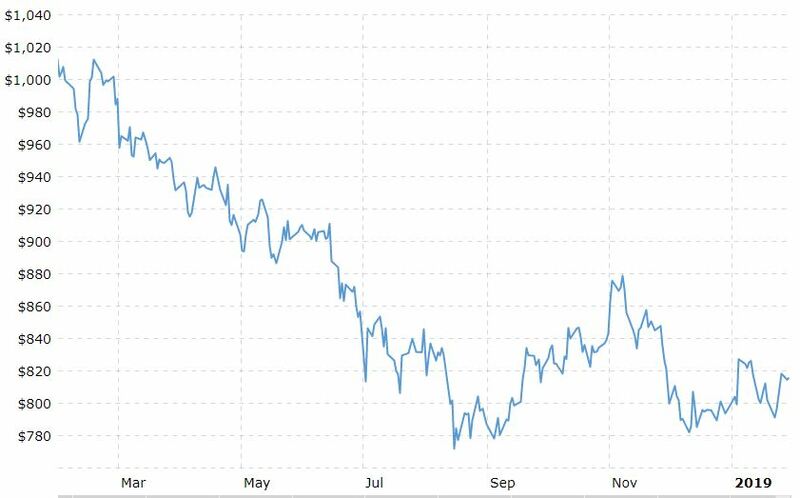 Despite all this, copper did not perform well in 2018. But we think the pullback is an opportunity to buy. There are several ways to get exposure to copper. But we think the best way is through mining equities. Now, copper is found all over the world and there are countless copper stocks. We believe the safest ways to get short- to mid-term exposure to copper stocks is through an equity fund; either a mutual fund or ETF. Of course both are going to cost you in fees. But if you were putting together a similar portfolio, it could also cost you an arm and a leg in just trading fees. There are several copper mining-focused funds, including Global X Copper Miners ETF (NYSE: COPX) which is perhaps the most well-known. One benefit mining ETFs have over others is they often include equities that might be otherwise present ownership problems for U.S. investors. For example, many of the components of COPX are foreign-based companies with their main stock listing on a foreign exchange. Most also have OTC listings, but OTC listings of smaller companies can sometimes have liquidity issues. But, okay, you just want one copper mining stock to stick in your portfolio. Which one is the best? Well, that's very hard to say. See, copper mining companies are in a lot of debt. All of them. Freeport-McMoRan (NYSE: FCX), the world's largest public copper miner, is sitting on over $11 billion in debt. BHP Group (NYSE: BHP), the world's second largest public copper miner (although the companies overall production is diversified among many metals), is sitting on some $28 billion in debt. All of the major public copper miners are sitting on a considerable amount of debt, and most of the smaller ones are too. So it's very difficult to recommend putting all you eggs into one basket here. But since we're focused on energy metals in this report, we'd like you to take a look at Glencore (OTC: GLNCY). Glencore (an acronym for Global Energy Commodity Resources) is an Anglo-Swiss multinational commodity trading and mining company based in Baar, Switzerland. The current company was formed by the merging of Glencore and Xstrata in 2013 and is today one of the largest companies in the world. Last year Glencore ranked 16th in the Fortune Global 500 list of the world's largest companies. Glencore has nearly 150,000 employees working in over 25 countries and produced 1.31 million metric tonnes of copper in 2017. It's one of the world's top ten copper mining companies. But we'll talk about Glencore more in a bit. And the reason will become obvious later. For now, put the stock on your radar. We know that we said OTC listings for smaller companies can sometimes have liquidity issues. But that's not the case with GLNCY. Average daily volume is just under 300,000 shares per day trading over $2.1 million dollars at current prices ($7.75). There is a group of six metallic elements that have similar physical and chemical properties, and that tend to occur together in the same mineral deposits. These are known as the Platinum Group Metals. 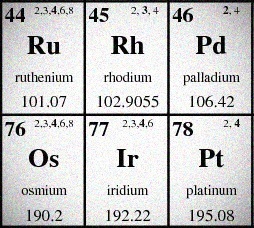 They are ruthenium, rhodium, palladium, osmium, iridium, and, of course, platinum. But here we're only going to take a look at three: platinum, palladium, and rhodium. That's because these three rare metals help support an entire global industry focused on cleaning up emissions from fossil fuel burning vehicles. Well, in short, this hierarchy an expression of real and perceived values and merits inherent to each of the metals; including their chemical properties, rarity, and beauty. Silver is considered more precious than bronze. And gold is considered more precious than both silver and bronze. Similarly Queen Elizabeth II celebrated her golden jubilee in 2002, having ascended the throne 50 years earlier. In 2022, the Queen will celebrate her platinum jubilee. Like gold, platinum is very resistant to many different types of corrosion. That makes the metal a great option for wealth storage; and therefore partially a monetary asset. See, the overall abundance of an element doesn't matter unless we can economically mine it. According to the National Ocean Service, the world's oceans contains 20 million pounds of gold suspended in normal seawater. At $1,300 an ounce, that's worth almost $380 billion. The problem is all that gold is distributed all over the global. It's not concentrated in one place, making mining gold from seawater completely uneconomical; at least at $1,300 an ounce and with currency technologies. The same thing applies to platinum. There are very few places in the world where platinum is concentrated enough that it's economically feasible to mine. ...VERY few. There are so few, almost 70% of all the world's economically feasible platinum locations exist in one single county: South Africa. Another 15% comes from Russia. And the rest, only another 15%, is sourced from elsewhere around the world. That results in much lower overall production than gold, silver, or most other metals but a wide margin. A little under 3,300 metric tonnes of gold is produced globally each year. Compare that to the 250 metric tonnes of platinum mined annually. But platinum has one trick up its sleeve that gold doesn’t. One that puts the metal into focus for energy investors. You see, platinum has some very special chemical properties. Platinum can absorb large quantities of hydrogen gas. In a way, platinum soaks up hydrogen the way a sponge soaks up water. And that makes it a vital material for treating exhaust from fossil fuel burning engines. Platinum is mainly used as a catalytic material in auto catalytic converters, which converts toxic gases (carbon monoxide and unburned hydrocarbons) into less harmful byproducts (carbon dioxide and water). 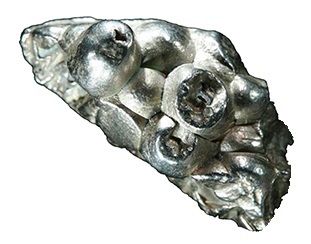 In fact, more than 40% of all the world's platinum mined ends up in a catalytic converter. There's platinum outside right now under your car? Yeah, but don't get too excited. 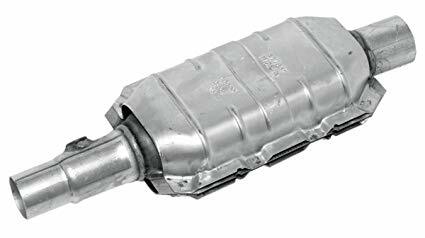 There's only about 5 grams of platinum in a typical catalytic converter. And you need that thing on your car...or at least I'm certain your State's vehicle emissions department will protest if they catch you driving around without one. Even though there's only a little platinum in each catalytic converter, every gas-burning vehicle on the road in the world has one. And at the end of the day the single biggest demand for platinum comes from catalytic converters. Of course, platinum is used jewelry and other things. But What that means is the catalytic converter market is the main driver of the platinum market. But before we go any further, it's time we must mention platinum's sister's palladium. See, both platinum and palladium have that very special chemical property that allows them to adsorb hydrogen. 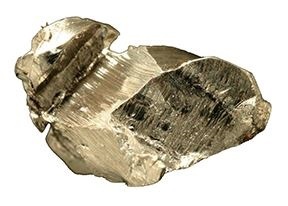 As the main catalyst material platinum and palladium can be substituted for each other. So if you were building catalytic converters...and you could use either platinum or palladium with virtually equal results...which of the metals would you use? Probably the cheaper one. And that's exactly what automakers did. If platinum was cheaper than palladium, manufacturers would buy up platinum for their catalytic converters. And if palladium was cheaper, they'd buy that. Of course if the demand for the cheaper metal outpaces supply, which is frequent due to low global production, it increases in price. Too much and the cheaper metal becomes the more expensive metal. Ultimately the demand for the cheaper metal would become so high that the cheaper metal would no longer be cheaper. And, of course, once that happened, catalytic converter manufacturers would just substituted one for the other again. The price of platinum and palladium have traded places as world's most expensive precious metal over the past several years. Right now, palladium sits on that throne; which we should discuss briefly now. The price of palladium has already broken records early this year. 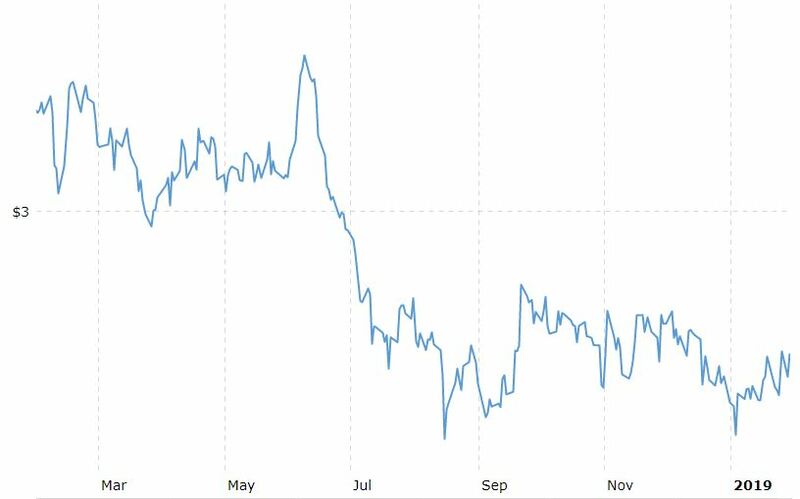 From August 2018 to January 2019, palladium prices increased by almost 60% to an all-time high over $1,400 an ounce. At the time, palladium was $100 more expensive than gold. And almost $600 more than its cousin, platinum. Why were prices so high? Well, remember when I said the demand for the cheaper metal would become so high that the cheaper metal would no longer be cheaper. Yeah, that's what happened. 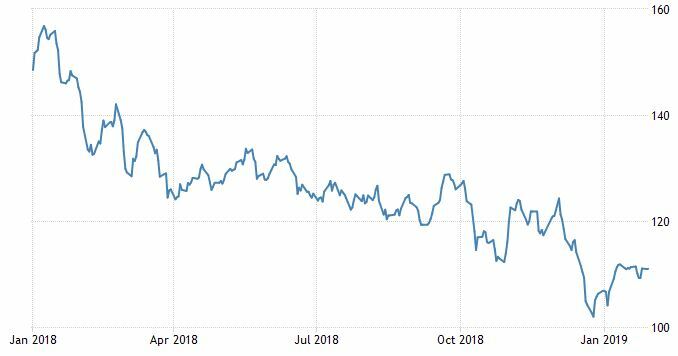 Since palladium prices have been so much cheaper than platinum over the past several years, automakers have been buying up the metal to use in their catalytic converters. Now, they've bought up too much and the demand is being reflected in prices. So which palladium prices high right now, won't automakers switch again to platinum? And doesn't that mean you should buy platinum...especially considering the metal's discount price to palladium? Investing in either platinum or palladium has major drawbacks. And the biggest drawback is a extreme lack of investment options. You could invest in platinum or palladium through owning physical bullion. You could. But you probably shouldn't. See physical precious metals always come with a premium attached. That's how bullion dealers pay to get the metal from the distributor to you as well as to pay himself and keep the lights on. A typical premium on a standard one ounce of gold is around 5%. For a standard one ounce of platinum that premium shoots above 10%. And for palladium, it could be as high as 20%. Fact is, there's a much lower demand for platinum and palladium bullion compared to gold or silver. So bullion dealers need to charger higher premiums to make reselling platinum and palladium worth their time. On top of high premiums, platinum and palladium bullion is not as liquid as gold or silver. 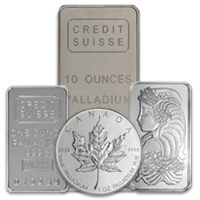 Sure, it's easy to find many bullion dealers who sell platinum and palladium coins and bars. But it's not so easy to find many who buy platinum and palladium bullion. Sometimes bullion dealers to buy platinum and palladium. But only sometimes. If you're going to buy platinum or palladium bullion for investment, make sure you have someone to sell it to first. But aside from the high expense ratio, liquidity can again be a problem. PPLT's average daily volume is around 79,000 shares. Compare that to the 9,000,000 SPDR Gold Shares ETF (NYSE: GLD) traded everyday. PALL's average daily volume is even less at under 24,000. So both PPLT and PALL are far from an ideal investment. How about platinum and palladium mining stocks? Well, as we already mentioned platinum and palladium tend to occur in the same ore deposits. That means where you find platinum, you're usually going to find palladium, and other PGMs. So there's really not pure platinum or pure palladium play. What investors own are Platinum Group Metal stocks. One problem though: There aren't many to choose from. 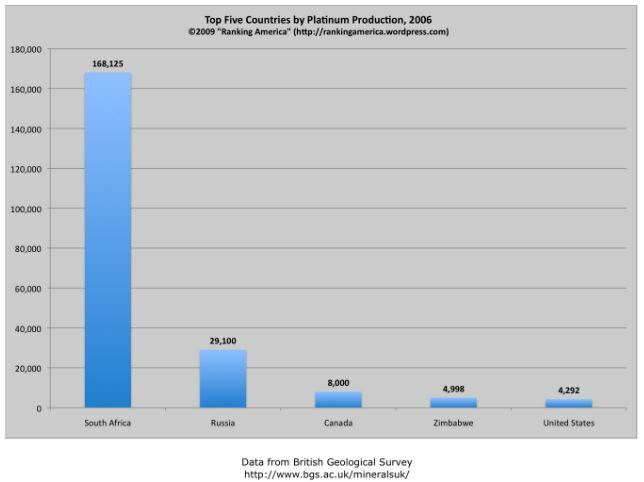 That's because, as already mentioned, platinum mining is quite rare and mostly located in one single country. The two largest public companies investors should pay attention to the most are Anglo American Platinum (OTC: ANGPY) or Impala Platinum (OTC: IMPUY). In the long-run, we believe these are probably the safest platinum group metal plays. There are one or two much smaller companies that focus on PGM mining. But the bigger companies are the safest. 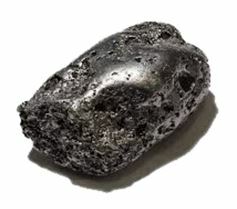 Rhodium is another PGM that's also mined along side of platinum and palladium. Rhodium is used in specialty optical instruments, electronics, aircraft turbine engines, and as a jewelry finish. But the primary use for rhodium is for automobile catalytic converters, specifically three-way catalytic converters. Autocatalyst manufacturing accounts for over 80% of the world's annual rhodium demand. So demand from the automobile industry is critical for rhodium. But rhodium is one of the rarest metals on Earth – over 100 times rarer than gold. That makes production extremely limited. In fact, a year's worth of total global rhodium production could fit on the back of three pick-up trucks. There are fewer than 10 mines in the world that produce significant quantities of rhodium. And most of those mines are located in one single country...you guess it: South Africa. 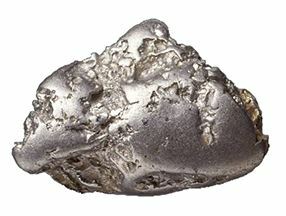 South African mines provide 80% of the world's rhodium supply. And this concentration of mining operations often leads to extreme price volatility. In 2008, supply shortfalls from South Africa caused rhodium prices to spike to over $10,000 an ounce. The economic slowdown of that year eventually caught up with rhodium, leading to a collapse in prices. Rhodium prices recovered a bit following the price collapse. But rhodium is often recycled from old catalytic converters. And an increase in recycling beginning in 2008 actually lead to an oversupply in the market — eventually pushing prices down to around $750 an ounce. The rhodium market is expected to remain in supply surplus this year. However, growing demand over the long term is expected to bring back a supply deficit. 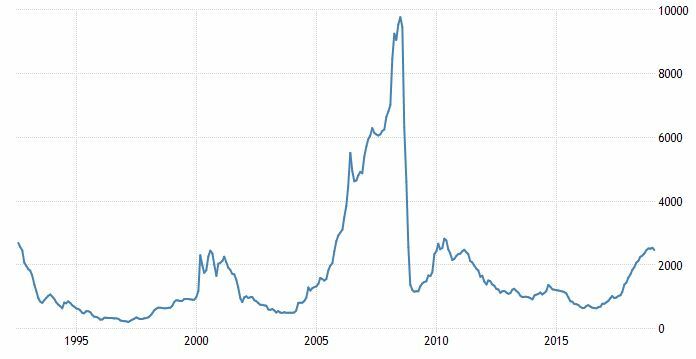 But even though rhodium's supply/demand fundamentals seem solid – and the upside astronomical, with prices once at $10,000 an ounce – the investment options are even more limited than platinum or palladium. The best option for investors looking to get some rhodium exposure is again Anglo American Platinum (OTC: ANGPY) or Impala Platinum (OTC: IMPUY). Ten years ago, the electric vehicle revolution was coming. It was a future dream. Today, it's happening. The dream has become a reality. And even though the EV industry has grown significantly over the past several years, the market is just now prepared to really take off. Global electric vehicle production is expected to increase by more than 30X in the next 15 years alone! 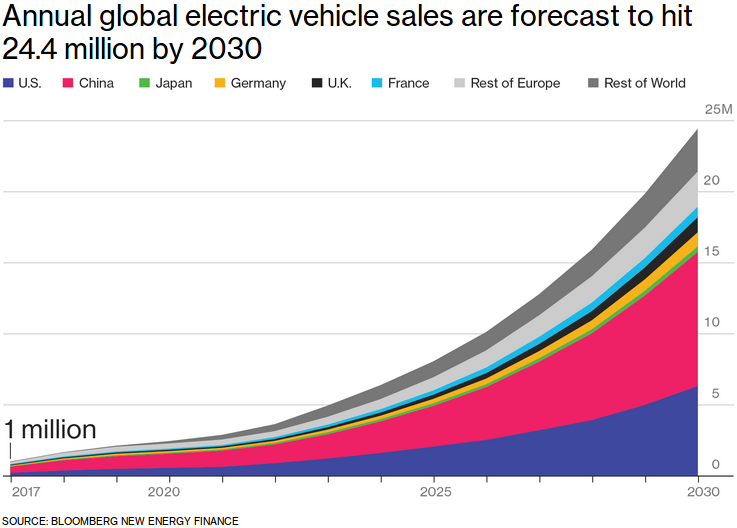 And right now they're all betting on China, which is already the world's largest market for electric vehicles. Chinese officials recently set a mandate for all automakers with annual sales of more than 30,000 vehicles in the country that will require 10% of all car sales to be all-electric or plug-in hybrid vehicles. By 2025, officials want a fifth of all cars sold in China to run on alternative fuel. The proliferation of the EV market in China and elsewhere has created a massive increase in the demand for lithium, a key component in the batteries that electric vehicles use to store energy. Companies that produce lithium are still investing billions to expand production. But with such an increase in demand, they still can't keep up. Lithium isn't necessarily rare. What's rare are mineral deposits with high enough lithium concentrations to mine economically. And this has led to a relative shortage of lithium mines. Despite mine shortage the price of lithium fell last year as much of the initial hype surrounding the metal deflates. We believe this is a good opportunity for new investors to begin a position or current investor to expand an existing position. Because lithium has been so popular over the past few years, there are still many scams out there. Usually these scams are in the form of overly exaggerated claims like, “this could be the largest lithium mine on this continent” or “this could be the most profitable lithium mine on this continent” or many other similar statement. Or promoters will often leave out key details about a particular project. That might be that there are environmental or social issues with mining the project. Or even that the project isn't economically feasible, even though there is a lot of lithium to be mined. With that in mind, we'd recommend staying away from anything that sounds too good to be true. Instead, place your bets with the big boys. Most of the world’s lithium is produced by an oligopoly often referred to as the “Big 3” of lithium. They are: Albemarle (NYSE: ALB), Sociedad Quimica y Minera de Chile (NYSE: SQM), and FMC (NYSE: FMC). These are probably the safest lithium plays for the short- and mid-term. With the price of lithium falling, share prices of these stocks fell in 2018. Now that a lot of the initial hype surrounding lithium has died down, it's a good time to get at least a little exposure. Cobalt is a probably metal you heard a lot about last year. The price of the silvery-bluish metal increased to multi-year highs as mounting supply concerns ultimately led to electric vehicle battery makers scrambling to secure the material. 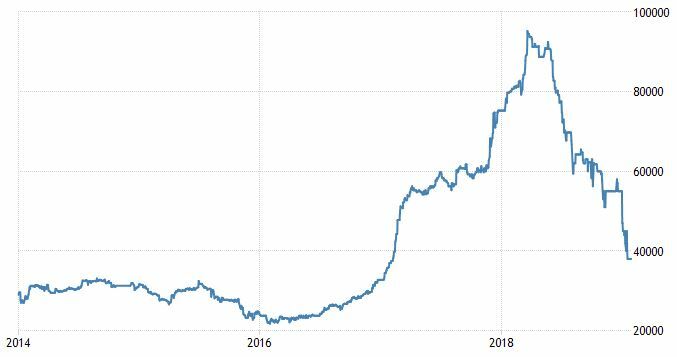 Between 2016 and the beginning of 2018, the price of cobalt had increased more than 300%. What do electric vehicle battery makers need with cobalt anyway? Well, as I'm sure you know electric vehicles use lithium-ion batteries to store energy. But the lithium-ion batteries used in electric vehicles aren't simply hunks of lithium with terminals. There are other key metals required to produce rechargeable EV batteries that are often overlooked. Rechargeable lithium-ion batteries are named for their active ingredients. Inside each is a lithium compound that acts as the battery's cathode material. 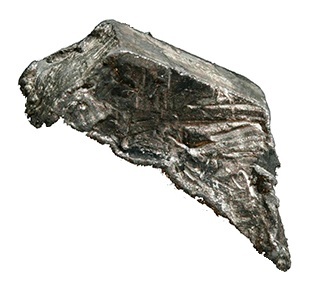 The most common lithium compound used today is lithium cobalt oxide, or LiCoO2. The cobalt in a LiCoO2 battery is the main active ingredient and allows for the recharging process. In other words, it's the cobalt in a rechargeable Li-cobalt battery that makes the battery rechargeable. The cobalt in a Li-cobalt battery is just as important as the lithium. Battery chemists also use other metals such as manganese and nickel to make compounds that serve the same purpose. But lithium cobalt oxide remains the preferred compound today. 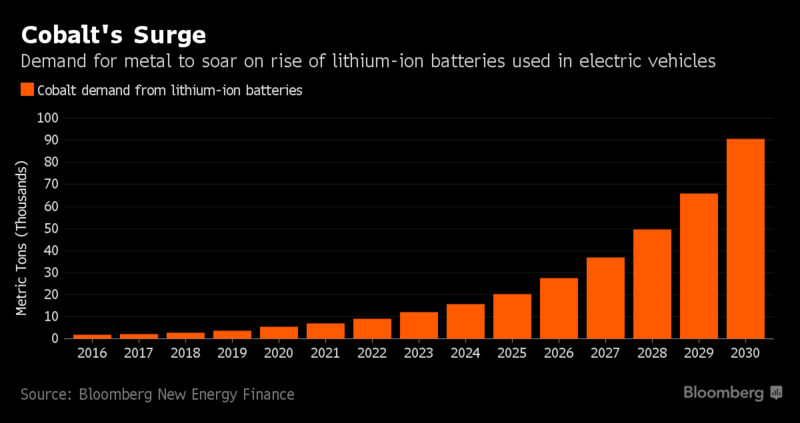 Roughly three out of every four lithium-ion EV batteries contain cobalt... a lot of it. On average, a single lithium-ion EV battery contains over 30 pounds of cobalt. And with conservative projections of a 20-fold increase in global EV demand, forecasts show a whopping 4,500% surge in demand for cobalt between now and 2030. But what about those supply concerns? Turns out the best place in the world to mine cobalt is the worst place in the world to mine anything: the Democratic Republic of Congo. Over 50% of the world's cobalt resources are located in the DRC. And currently, the DRC accounts for over 50% of global production of cobalt. But, as you've probably already guessed, the country hosts a mountain of issues that constantly threaten stable mining output. Geopolitical instability and corruption are commonplace. And key cobalt mines are frequently shut down. But now the DRC cobalt industry is also under harsh scrutiny for child labor and human rights violations. According to UNICEF, as many as 40,000 children were working in mines across southern DRC in 2014. It's a mess. That means investing in cobalt is difficult and risky. But if you wanted one cobalt stock to buy for your portfolio, you might want to consider Glencore (OTC: GLNCY). See, Glencore is not only one of the world's largest copper miners, it's also one of the world's largest cobalt miners. The company estimates it will produce about 20,000 metric tonnes of cobalt in 2019. That's 17% of total global production. Glencore is a play on both copper and cobalt and may be a great energy metal pick for your portfolio this year. You might have notice that uranium was not included in this report; even though it is a metal and even though it's main end-use is directly energy-related. That's because uranium is a power source. Uranium ceritanly is an "energy metal" by our definition. But for this report we wanted to focus on the supporting metals that contribute to the storage and distribution of energy. We hope you've enjoyed this report and we look forward to bringing you more high-quality research in the future.